Always a Bigger Fish Part 1 – Dogfish as Predators – Ya Like Dags? I’ve found myself with some breathing room between grading my students and studying for my own exams, so it’s time to write up a post I’ve been thinking about for a while. I’ve been wanting to do a quick summary of the role of the spiny dogfish in the Northwest Atlantic, featuring Squalus acanthias as both predator and prey, and how this abundant little shark affects and is affected by its ecosystem. Since spiny dogfish feeding ecology is also the focus of my thesis, these posts will provide a backdrop for my little study. For this first installment (I make no promises as to when the second installment will actually be posted) I’ll be looking at spiny dogfish as predators. Fisheries scientists are interested in the diet of the spiny dogfish because these are abundant, powerful predators that have been implicated as a possible cause of the decline of commercially-important species. Though dogfish do consume cod and flounder, they are much more likely to feed on species that are also preyed upon by cod and flounder. This is because, as relatively large predators that eat mainly fish, they are in the same feeding guild as many commercially-important species. “Guilds” are basically groups of organisms in a given ecosystem that utilize the same resources in roughly the same way. Garrison and Link (2000) grouped spiny dogfish and other fish-eating predators in the Northwest Atlantic in the Piscivore guild. Fish species within the Piscivore guild from the Northwest Atlantic ecosystem. From Garrison and Link (2000). There is a lot of interest in the food web ecology of the Northwest Atlantic primarily because many of the United States’ most important and oldest fishing grounds lie within this area, which stretches from Newfoundland and the Grand Banks to Cape Hatteras. This includes Georges Bank, which when discovered was so rich in cod and other edible groundfish that it was a major justification for settling North America. Consequently, this ecosystem was the first in US waters to be identified as overfished and as a result is very well-studied. Jason Link in particular has published a huge number of papers on the subject and is able to get at ecological trends in the ecosystem better than most due to his access to NOAA/NMFS’ food habits database, and you’ll see his name attached to everything I cite in this post. One noteworthy feature of the Northwest Atlantic is that it has a lot of built-in redundancy. There are no less than 13 species identified as large piscivores by Garrison and Link (2000), and the list reads like a rogue’s gallery of commercially-important fishes. Spiny dogfish share this ecological role with Atlantic cod, summer flounder, bluefish, and more recently-fished species like goosefish (also known as monkfish and “the flat angler fish from hell”). What this means is that should any one of these species get knocked out, another of the 12 remaining will rise to take its place. Thanks to overfishing, this is essentially what happened in the relationship between cod and dogfish. 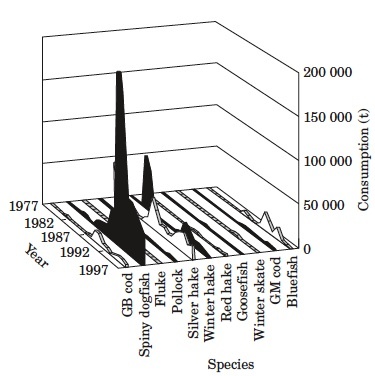 Consumption of fish prey by spiny dogfish from 1974 to 1998. White represents medium-sized dogfish, black represents large dogfish. From Garrison and Link (2002). 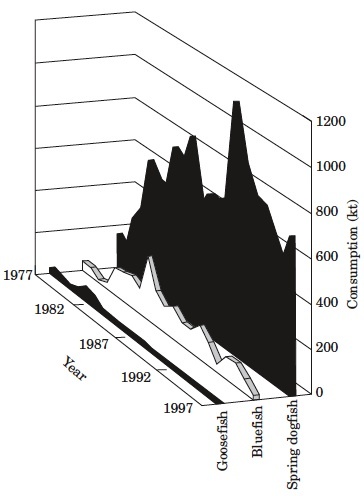 Fish consumption by Atlantic cod from 1974 to 1998. Black represents large cod, diagonal lines represent "extra large" cod. From Garrison and Link (2002). 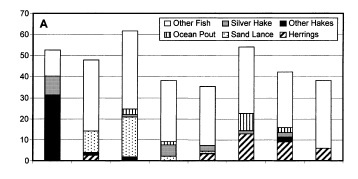 These charts represent Garrison and Link’s (2002) data on the total amount of fish consumed by the current dominant piscivore and the species that formerly sat on that throne. Around the mid to late ’80s you see a sharp downward trend in piscivory by Atlantic cod due to the fact that the species was being essentially strip-mined off of Georges Bank. As cod crashed, spiny dogfish picked up the slack in fish predation and proceeded to become the new dominant piscivore in the Northwest Atlantic. It turns out, this is a job that spiny dogfish do very well. Total estimated consumption of prey species by three principal piscivores in the Northwest Atlantic from 1977 to 1997. From Overholtz et al. (2000). In the case of predation, particularly when species we also like to eat are involved, what is being eaten is even more important than how much is being eaten. Spiny dogfish are opportunistic, feeding on whichever fish species happen to be available and this can vary by both time and geographical area. What they’re eating off of North Carolina has been keeping me wrist-deep in shark puke for most of my grad-school career and their diet can also vary by time based on what’s being overfished, what’s migrating in and out of the area, and any number of other factors. Time can also affect whose ecological niche dogfish are muscling in on. Proportion of fish species consumed by spiny dogfish from 1974 to 1998. From Garrison and Link (2002). Proportion of prey species consumed by Altantic cod from 1974 to 1998. From Garrison and Link (2002). Both dogfish and cod consume a wide variety of fish species but herring have recently become more important to the diet of both predators, which opens up the possibility of intense competition between them. According to Overholtz et al. 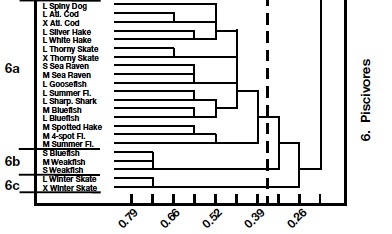 (2000), spiny dogfish show a preference for pelagic species. Just as spiny dogfish have become the dominant piscivore in general in the Northwest Atlantic, they have also become the most important predator of Atlantic herring. Dogfish don’t do anything halfway. Consumption of Atlantic herring by principal piscivores in the Northwest Atlantic from 1977 to 1997. From Overholtz et al. (2000). It is worth noting that this seemingly high level of consumption is also a factor of the spiny dogfish population. At the time of these studies, spiny dogfish had yet to demonstrate the signs of overfishing that marked their management in the late ’90s – early 2000s. What would be interesting would be to see how the more recent fluctuations in the dogfish stock have affected their interactions with their prey and competitors. Garrison and Link (2000) were already noting at the end of their study that medium-sized dogfish were consuming more fish as the numbers of larger dogfish began to fall as a result of fishing pressure. In conclusion, spiny dogfish are among the most important predators on other fish species, and are currently the dominant fish predator in the Northwest Atlantic. However, the ecosystem is full of piscivores waiting to take the top spot as soon as the current lead gets bumped off. Jason Link’s talk at AES about modeling the effects of the removal of dogfish from the ecosystem basically showed that, while species-specific interactions might be affected, the ecosystem would largely remain stable due to other piscivores taking over the niche. However, with fishing pressure increasing on many of the piscivores that were once considered “trash fish,” it remains to be seen if humans can remove all other competitors to the title of dominant predator in the Northwest Atlantic. back in 1963 i got a Dogfish from Wards Science supply and did a very detailed dissection of it for my major project in High School biology.i was just a kid when i mail ordered it,i see you can’t do that anymore.too bad, it all seems to be robots and computer making these days……..just a post midnight thought from a old guy……..
Pingback: Striped Bass Eat Too Much | Ya Like Dags?